Our pilgrimage group moved from the Cathedral where Garcia Moreno’s macerated body was placed before Our Lady of Sorrows to the Dominican Convent of St. Catherine of Sienna. Dr. Francisco Salazar continued his story from the upper choir of its church, where we could see the place in the right hand corner where the body was finally discovered. After the discovery of Garcia Moreno’s heart on April 11, 1975, Salazar was accompanied by the Bishop to the Dominican Convent, where his research led him to believe the remains of the President were hidden. The Bishop ordered the Mother Superior to cooperate fully in the search. The next day, Dr. Salazar spoke with one of the older nuns, Sister Ana Maria Arroyo, who had some interesting information. She had four documents that affirmed that Garcia Moreno’s body had indeed been buried in the convent. One can to see how well kept secrets were in the silence of the cloisters. A second note, signed by the same Sister and dated February 28, 1941, added a detail: The body had first been buried under the main altar, but then removed because it was feared it might be discovered there. The third, dated 1959 and addressed to the Cardinal from the Mother Superior at that time, was to notify him a priest had asked permission to search for the body of Garcia Moreno in the Church. The Cardinal’s reply, the fourth note, also dated 1959, explained there was no need to search for the location of the body of Garcia Moreno since he knew exactly where it was and could arrange for its exhumation when he deemed the time right. But that Cardinal never judged the time right. He died nine years later without exhuming the body or telling anyone the secret. 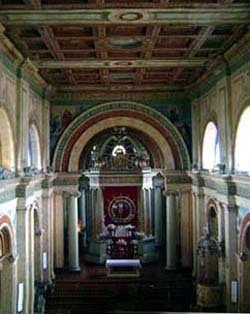 The only recourse for Dr. Salazar was to follow the lead of the main altar and the hint about the ladders. On April 14, 1975, he ordered workmen to raise the floorboards under the main altar. The space was there, but it was empty, as the note had affirmed. More floorboards were lifted to the right of the altar, then to the left, then on to the side altars. Dr. Salazar complimented the patience of the Mother Superior, who had to bear the checkerboard work he directed of lifting squares of floorboard throughout the Church. The key question remained unanswered: Where were the ladders stored more than 20 years ago? No one knew. So Dr. Salazar returned to his best source of information, questioning the oldest sisters. One of them took him to the upper choir, where our group was standing that day, and pointed to a place near the door to the right of the sacristy. She recalled being told when she was still young that the Garcia Moreno’s remains were there. 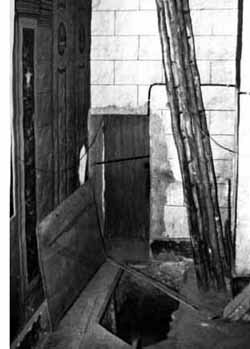 It seemed illogical – to store ladders in front of a door, or to bury a body in its doorway. Then he learned the door was only recently constructed, an addition made by the present Mother Superior as an entry for the priest so he would not have to use the main door. The walls around the door were searched. Nothing was found. The floorboards were lifted. Again, nothing. At the end of the day, Dr. Salazar ordered the workmen to dig into the ground close to the door. Under the floorboards, the workmen found the supporting beam and, around it, earth. They poked the ground with bars. Suddenly, one of them plunged into an empty space. A hole! After removing the soil, they could see a large box in a space about 4 feet deep. The hole was dark, surrounded by earth. “I’m going in,” Salazar announced. “Aren’t you afraid of ghosts?” asked one apprehensive sister. “Not a bit,” he replied, trembling with excitement, not fear, at the thought he was at the end of his quest. Candle in hand, he entered the hole and raised the lid of the box. He saw something bright reflecting the candlelight. It was a crystal vial. In it he could make out a photograph of Garcia Moreno. This is it, he thought. 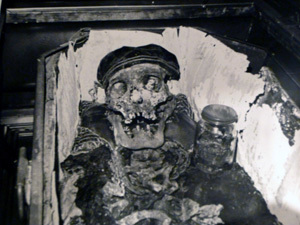 We have the remains of Garcia Moreno. He put his hand in the place he thought the head should be, but only felt some velvet cloth. Cardinal Munoz Vega was notified and arrived shortly to inspect the contents of the box. On its lid, they found the yellow nails spelling GGM. The body had decomposed and only the skeleton remained, as seen in the picture at right. Atop the skull was a velvet cap, which is what Dr. Salazar had felt when he placed his hand in the coffin earlier. 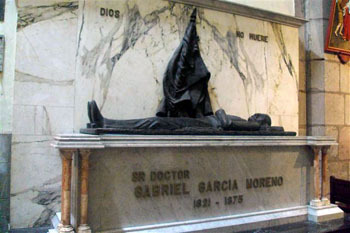 Dr. Salazar placed the box and remains of Garcia Moreno into another coffin that he purchased. 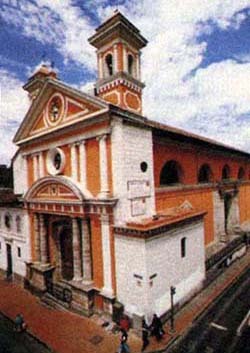 The Dominican Church was closed to the public, and on June 27, 1975, the Bishops of Quito met there to verify and officially proclaim that the skeleton was that of Garcia Moreno. On August 6, 1975, the 100th anniversary of the death of Gabriel Garcia Moreno, his remains were transferred with solemnity from St. Catherine Church to the Cathedral. There his corpse was placed in a crypt in a side niche to the left of the main altar, where the people of Ecuador - and pilgrims like us - can pay homage to him. Later Dr. Salazar showed to my friend Judy Mead and me some of his prized relics that he kept in memory of his discovery: some of the lining of the cap found on the skull, the Paris tag and golden cuff from the jacket he was wearing, and his greatest treasure, the first cervical vertebrae from the body of Garcia Moreno. We had the privilege to venerate that good-sized relic of the great Catholic President who had so valiantly and successfully defeated the Liberal policies promoted by Freemasonry in that turbulent period of South American history. His interest in Garcia Moreno brought Dr. Salazar to the knowledge of Our Lady of Good Success. He was fascinated to learn that the Our Lady had foretold in the 1600s – with perfect accuracy – that a President would come in the 19th century who would combat Freemasonry, consecrate the Country to the Sacred Heart, and die a martyr’s death. By speaking of this man who boldly countered the Liberal politics of his day, I believe Our Lady was clearly showing her disapproval of the new notion of separation of Church and State, always condemned by the Church and Popes. It is sad to see that today the post-Vatican II Popes and Hierarchy have aligned themselves with the principles of the Enlightenment, which are fundamentally the same ones that Garcia Moreno combated. Our Lady of Good Success predicted not only the crisis in the Faith that we are experiencing today, but she also announced the restoration of the Church and Christendom. We who share the ideals of the “truly Catholic President” Gabriel Garcia Moreno are also privileged to participate in this fight to establish the Kingship of Christ on earth. 1. 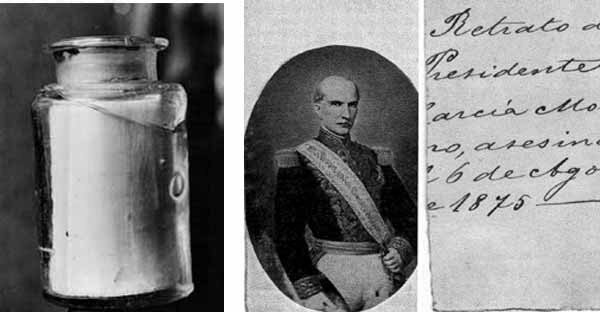 The texts of the two letters found in the vial can be read in Encuentro con la Historia, pp 245-255, or Encounter with History, pp. 185-191. Part V: "My Sons, I Am Poisoned"